A great alternative to e-wallets and credit card payments is the Payforit casino system, especially convenient for mobile casino users. What Payforit does is to charge your mobile phone. No banks, no credit or debit cards and no vouchers required. You can make a Payforit mobile casino deposit in no time! It’s quite a modern invention, but it is also logical and easy to execute, which is why more and more casino fans are opting for Payforit as their preferred casino banking method. Let’s find out more! 18+, first deposit only, T&Cs apply. Casino bonus: min. £10, max. £100. Wagering x35. Max. bonus bet: £5, can vary. The Payforit mobile casino system works best in the UK where mobile networks like Three, Vodafone and O2 have been supporting it for a while now. Basically, Payforit is not a standard payment method. It’s more like an intermediary between the casino and mobile operators. 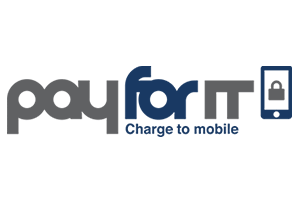 Mobile payments are simple and fast when you use Payforit because mobile operators process the payments immediately. To transfer money from your mobile device to a casino account, you need to join a Payforit casino – a venue that supports this type of deposits. If your phone bill arrives at the end of the month, the amount will be added to your monthly bill. Otherwise, the amount will be immediately deducted from your phone credit. Either way, you’ll get the funds to your casino balance straight away. Payforit Casinos: Are they Safe? Payforit is known to be fast, convenient and efficient. But is it safe? When you gamble with real money, safety is one of the top concerns. The risk is big enough as it is, and no one wants to enhance it by using unreliable and insecure methods of payment. But no worries, you can put your mind at ease because Payforit is certainly not one of those misleading, shaky services. Online casinos that support Payforit are safe and trustworthy, and you should have no restrains about making a Payforit casino deposit. The Payforit casino system is conceived in such a way that doesn’t require a player to reveal any personal information. Hence, a credit card or even a bank account is not required. Payforit excels in safety for this one simple, but crucial, reason. Apart from the fact that no banking information is required, a great level of security is achieved by making the player confirm the payment each time a transaction is made. Paying with phone credit is something that guarantees privacy – you will get charged as you were making a phone call. Identity theft or fraud is impossible as no banking details are associated with your casino account. Furthermore, Payforit has an assembly of regulators behind it that make sure all the guidelines are honoured and all the activities are in accordance with the law. Legal recourses protect every Payforit user in the online gambling environment. Such a method is the perfect choice for gamblers who spend a lot of time on the move, don’t wish to share their personal banking information on the web and are fine with making smaller deposits to their mobile casino accounts safely. The only information you’re providing about yourself throughout the whole process is your mobile phone number. And that’s a really big advantage. Payforit is strong in terms of security and anonymity, so you have nothing to worry about. Every payment is confirmed by a unique text message and the entire transaction process is conducted in a controlled environment at the Payforit mobile casino. Another major advantage of Payforit mobile casinos is that you don’t have to sign up to any wallets, or websites, or download anything. As long as you have access to a supporting mobile network, you’ll keep receiving your phone bill as before, with your casino purchases added at the top. The only downside of Payforit is that the system has low deposit limits. If you’re a high roller and you want to make higher deposits, then Payforit may not be for you. Still, Payforit is at its popularity peak and we can safely assume that its popularity will increase and hopefully the limits too!